The Samsung Galaxy Note 9 is one of the absolute best extra-large phones on the market. Now two years removed from its debacle with exploding batteries in the Galaxy Note 7, Samsung has successfully gotten the stylus-aided phablet line back on track—and the Galaxy Note 9 is proof that these extra-large, extra-premium phones are only getting better. The Galaxy Note 9 is not dramatically different from the Galaxy Note 8 before it. But that's not a bad thing: the upgraded polish and power of the Note 9 makes this the big-screen phone of choice for people who need to be productive from anywhere. Of course, the luxury of a stunning screen, expanded battery, and S Pen stylus are reflected in the high price tag. These are features that will be well worth the expense for some, but not everyone. We tested the Galaxy Note 9 for more than a week—savoring the additional screen real estate and doodling whenever possible—while considering its usefulness and value compared to the current smartphone competition. Shot with the Samsung Galaxy Note 9. The Samsung Galaxy Note 9 is large and in charge, to the point that it could actually pass for a small tablet. At 6.4 x 3 x 0.3 inches and 7.1 ounces, this phone isn’t really meant as a one-handed device—if you hold it steady (without shimmying the device around in your hand), you're likely to have at least a third of the screen out of reach of your thumb. The glass design can make the phone feel a little slippery as well. These things considered, the Note 9 is really best for two-handed use. As mentioned, the Note 9 is pretty similar in design to the Galaxy Note 8, and both share design elements with Samsung's smaller Galaxy S9/S8 flagship models. They're all aluminum and glass, but the Note 9’s curved 6.4-inch screen is a tiny bit larger than its predecessor. This display has a small bezel on the top and bottom, and you can make out the black border on the right and left sides more easily than on the Galaxy S9. That's because the Galaxy Note 9 has a subtler curve to the screen, likely due to the S Pen stylus and the need for a flatter writing and drawing surface. The upgraded polish and power of the Note 9 makes this the big-screen phone of choice for people who need to be productive from anywhere. The S Pen itself is stored in a slot at the bottom of the phone. Press in on the end and the stylus pops out enough to remove it; push it back in when you’re done and it automatically recharges. And yes, it does have a battery—that’s due to the newly-added Bluetooth connectivity, which lets you use the tiny button on the S Pen to click the camera shutter, pause music, and trigger the eraser while drawing. For the most part, those remote features don't significantly enhance the Note 9 experience, but you might find a handy perk or two in the mix. If you flip over the Galaxy Note 9, you’ll notice that the fingerprint sensor is (thankfully) separate from the camera module, which was a design flaw on the Galaxy S9 phones. Unfortunately, this placement combined with the large size of the phone can make it a difficult to reach with your pointer finger while holding the phone with one hand. Luckily, the Galaxy Note 9 also has facial and iris scanning via the front-facing camera, as well as an Intelligent Scan combination of the two features for an extra level of security, so there are other biometric unlocking options. The Galaxy Note 9 is available in Ocean Blue, Midnight Black, and Metallic Copper color options. We think the Ocean Blue is particularly striking, and the glossy cobalt blue tone is made all the more eye-catching by the contrast of a bright yellow stylus. The other two models are pretty subdued in comparison, so we like that the blue has a little flash. You can buy the Galaxy Note 9 in two storage sizes, 128GB and 512GB, although you can also install a microSD card to expand either. It's easy to get up and running with the Samsung Galaxy Note 9 right out of the box. Once you power it on, the phone will ask you to connect to a Wi-Fi network or use your cellular connection, and after agreeing to the terms and conditions, you can decide whether you want to restore the phone from a backup of another phone or start fresh. From there, you'll choose a security option. The Galaxy Note 9 features facial and iris scanning from the front-facing camera, and has the aforementioned Intelligent Scan option that combines both. You can also opt for fingerprint security, or use a PIN code or password. After a few more screens of Google and Samsung-related options (including the option to transfer data from another phone or Samsung's cloud service) you'll be on the home screen and ready to use the phone. Take a peek at our guide to creating a Samsung account. With a Qualcomm Snapdragon 845 processor and 6GB RAM, the Samsung Galaxy Note 9 is one of the most powerful Android phones on the market today. That powerful chip is key to its smooth performance, allowing you to rapidly flip through open apps and navigate around the interface without a hitch. You can even play graphically intense games like “Asphalt 9: Legends” and “PUBG Mobile” with ease. Granted, the Snapdragon 845 is not the most powerful smartphone chip of 2018—Apple's A12 Bionic processor in the iPhone XS, XS Max, and XR posts better numbers in benchmark testing, and 2019's new flagship phones are beginning to roll out with the enhanced Snapdragon 855 onboard. However, the Snapdragon 845 still provides plenty of power for all your entertainment and productivity needs. As far as we're concerned, there's no better smartphone screen on the market today. In PCMark's Work 2.0 benchmark test for performance, the Note 9 scored 7,422, which is better than the Galaxy S9 (7,350) and the Huawei P20 Pro (7,262). We also subjected the Note 9 to some graphics performance tests: it registered 19fps in GFXBench's visually-demanding Car Chase benchmark, and 60fps in the T-Rex test. Want to take a look at some other options? See our guide to the best Samsung phones. The Samsung Galaxy Note 9 performed well in connectivity testing, typically pulling a download speed of about 35-40Mbps on Verizon (in an urban area) and an upload speed between 5-9Mbps. These are consistent with speeds seen on other smartphones in the same area. The Note 9 also supports both 2.4Ghz and 5Ghz Wi-Fi. As far as we're concerned, there's no better smartphone screen on the market today. The Galaxy Note 9's 6.4-inch panel is the same resolution as the 5.8-inch Galaxy S9, and while the Note 9 packs in fewer pixels-per-inch due to the larger frame, the difference is imperceptible—the display on the Note 9 is a stunning Super AMOLED panel, delivering rich, vibrant colors and impeccable detail. Of course, the super-sized screen amplifies the viewing experience, whether you're watching videos, playing games, or just browsing the internet. The Galaxy Note 9's screen provides so much space to soak in content that the visuals are nothing short of dazzling. 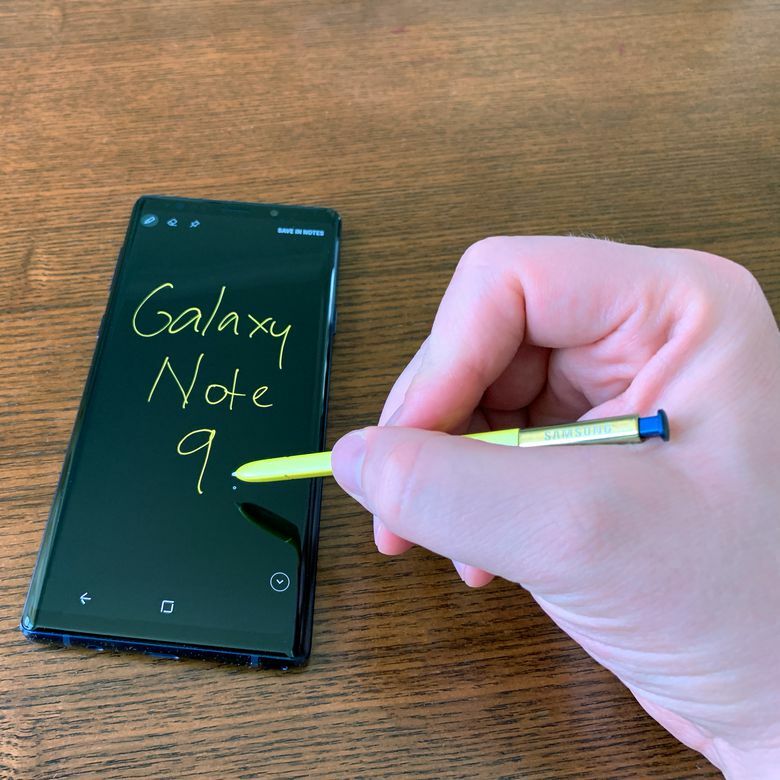 The phone might be largely defined by its S-Pen stylus, but the screen is arguably the Note 9's best feature. The Galaxy Note 9 delivers very good sound from its stereo speakers, with audible separation between the speaker at the bottom of the handset and the speaker situated in the top bezel near the earpiece. It's loud enough to deliver clear music playback in an otherwise quiet room without needing to use the higher volume settings, which is where you'll start hearing the limitations of the very small speakers. When we turned on the Dolby Atmos virtual surround option, we heard a bit more richness and fullness to music playback—it got a little louder, but was a also a bit more definition, too. Atmos also has settings for movies and TV shows, and others that emphasize voices, although the “Auto” setting will optimize playback for you depending on the type of content. Call quality was consistently strong in our testing, both when making and receiving calls from the Note 9. The Galaxy Note 9 takes excellent shots from its dual-camera setup, which has the same hardware as the Galaxy S9+: a main 12-megapixel wide-angle sensor that can swap between f/1.5 and f/2.4 aperture settings either manually or automatically, and a 12-megapixel telephoto sensor at f/2.4 that provides 2x optical zoom functionality. Both have optical image stabilization to steady your shots. The dual-aperture feature reads the available lighting and chooses which setting will produce the best shot. In bright light, the narrower f/2.4 aperture setting can grab more detail, and in lower light, the wider aperture of the f/1.5 pulls in more light to illuminate the shot. When manually switching between the settings in daylight, we didn’t notice much of a difference in our photos—they all looked bold and beautiful, with plenty of detail and vivid, lifelike colors. In low light, we noticed that the f/1.5 setting helped deliver a bit more detail and clarity than you'd expect from the average premium smartphone. The secondary camera lacks that aperture trick, but can typically grab clear, zoomed-in shots. We think the Ocean Blue is particularly striking, and the glossy cobalt blue tone is made all the more eye-catching by the contrast of a bright yellow stylus. Video shooting is also excellent on the Galaxy Note 9. It'll grab crisp and punchy 4K footage at 60 frames per second, and it has a very cool Super Slow-Mo setting that captures 960 frames-per-second footage (at 720p resolution). You can shoot Slow-Mo at 1080p as well, but at the less-smooth rate of 240 frames per second. From the front, the Note 9's eight-megapixel (f/1.7) camera takes fine selfies, and the software-aided Portrait mode—which blurs the background behind you—produces sharper and more convincing results than we saw on the Huawei P20 Pro. Take a look at our guide to the Samsung Galaxy Note 9 camera. The 4,000mAh battery pack certainly sounds immense on paper, but it's even more impressive in everyday usage. During the testing period, we didn't drop below a 50% charge on any day with average usage—that includes a routine mix of emails, web browsing, streaming music, app and game usage, and a bit of streaming video. In fact, we stretched a charge across two full days of moderate usage, finishing day two with 10% left. That's amazing. Your results may vary depending on what you use your phone for and how often you use it, but unless you're constantly using it for games and streaming video, it should easily clear a full day's usage and will likely stretch into a second day if needed. The Note 9 has wireless charging for easy top-ups, or you can charge a bit faster with the wired adapter included in the box. Check out our guide to saving battery on your Samsung Galaxy. Samsung puts its own touches on Android Oreo for the Galaxy Note 9 with a distinctive interface that is clean, responsive, and easy to navigate. As with other Samsung phones, you're welcome to download a different launcher from the Play Store if you don't like the look or feel of Samsung's skin. The Play Store also has a wide array of Android apps and games to download, many of them free. It's not as richly-stocked as Apple's App Store, nor does it have nearly the same quality of discoverability tools, but there's no shortage of software to try out. The Galaxy Note 9 uses Samsung's Bixby for a voice assistant, and it allows you to perform most phone tasks that you normally would with touch commands. You can ask questions, play music, send messages, and even scan items with your camera (Bixby Vision) to learn more about them. While a stylus might seem like an extraneous smartphone accessory at first, we found the S Pen to be a genuinely useful addition to this device. “Screen Off Memos” are our favorite feature—you can pop out the S Pen at any time and immediately start jotting down notes or scribbling on the screen, and it will instantly create a note. Need to take down a phone number or a quick shopping list? This feature is faster than unlocking the phone and using the virtual keyboard. The S Pen is precise and responsive, and the Note 9 is smart enough to only take input from the stylus itself—if you accidentally touch the screen with the side of your hand while writing, the screen won’t register that touch. Other neat S Pen features include rapid translation of highlighted words and instant, customized screenshots, but we mostly used it for notes, drawing, and coloring. That's the good stuff, but not everything is rosy here. Samsung's AR Emoji mode does a poor job of capturing your image to create a cartoon avatar. Even if you manage to get something that looks like you, the avatars themselves are pretty creepy-looking. Take a peek at some amazing facts about emoji. At $999 for the base 128GB model and $1249 for the 512GB edition, the Samsung Galaxy Note 9 certainly isn't cheap. This is a top-of-the-line phone packed with power and premium technology, and you'll pay for that luxury. However, for users who don't need the S Pen stylus and can deal with a slightly smaller screen, there are rival Android phones that offer a lot of the same components and features for significantly less money, including Samsung's own Galaxy S9+, which is now only $699. Samsung and Apple are longtime rivals in the smartphone space, and if you're considering a large phone like the Galaxy Note 9, then you may also be thinking about Apple's iPhone XS Max. It's the largest iPhone to date, with a 6.5" OLED display that has the same kind of notch at the top as the earlier iPhone X, housing the front-facing camera and 3D-scanning sensors. The iPhone XS Max is a beautifully minimal handset with an ultra-premium glass and stainless steel build. It also has the fastest smartphone chip on the market right now, the great iOS 12 operating system, and all of the benefits of the App Store—which has a fair number of worthwhile apps and games you won't find on Android. However, the iPhone XS Max starts at $1,099, which is a full $100 more than the Galaxy Note 9. Plus, the Note 9 has a slightly higher-resolution screen, almost the same amount of processing power, and a much longer-lasting battery. You also get more starting storage with the Note 9, and the ability to add more via microSD. If you love iPhones, the XS Max is the best one yet. But you'll pay a lot for that luxury—enough to make the $999 Note 9 seem cost-effective by comparison. A beautiful device, but with a high price and niche appeal. ﻿The 6.4-inch screen is unparalleled, it packs in plenty of power, and the S Pen stylus makes it easy to jot down notes and sketch out ideas, wherever you are. On the other hand, anyone on the hunt for a more general-use handset meant for everyday communication and entertainment probably doesn't need to shell out $999 for these added perks. The 2019 Samsung Galaxy S10+ offers some newer tech and abilities for the same price, while last year's Galaxy S9+ is now significantly discounted and closely mirrors the Note 9 feature set, outside of the S Pen stylus. Product Dimensions 0.3 x 3 x 6.4 in.